A widespread method used for the detection of microbes is petri dish culturing, in which microbes are cultivated in a petri dish and then monitored. However, this method takes skilled workers to perform manual operations for over several days and is highly cost consuming. 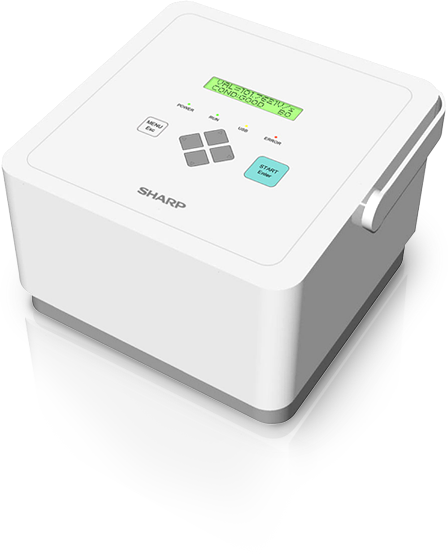 Sharp started a research and development project named SDT (SHARP DREAM TECHNOLOGY) in 2009, with a strong determination to make microbes visible in a short measuring time. The challenge was to create a completely new measuring method to realize that goal. At first, the project team focused on the phenomenon that when microbes are exposed to a certain wave length light, the microbes glow in fluorescent green, and gradually degrade (fluorescence level decreases) after being continuously exposed to the light. This phenomenon is applied to measure microbes by distinguishing their degradation amount. However, it was soon learned that the fluorescence of microbes is faint, and it would be extremely difficult to raise the measurement precision to a commercializing level. Other methods were also difficult to realize due to technical reasons, and the project had seemed to reach a dead end, with its time limit approaching. And then suddenly, there was a fortunate incident. A new experiment was carried out based on the theory that heating may accelerate the degradation. The results were not exactly what were expected. The microbes started to glow, and their fluorescence reached a sufficient level for commercialization. This phenomenon was verified as being caused by "Maillard reaction*1," and only living organisms will be fluorescent. This was the breakthrough for a unique measuring method to visualize microbes. It was named "heat-induced increase of fluorescence. *2"
*1 Maillard reaction: a chemical reaction between reducing sugars and amino acids creating a fluorescent substance "melanoidin" when heat is induced. A characteristic reaction seen only with biological proteins. 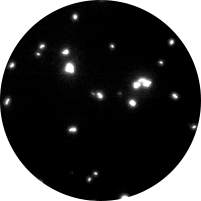 *2 Heat-induced increase of fluorescence: Sharp's unique measuring method of microbes by inducing heat to create fluorescent substances (patented). Maillard reaction is applied to this method. The detecting method was established, but there were many more challenges for commercializing, such as "small-sizing" and "cost reduction." These were unfamiliar fields for the project team members who were all researchers, but fortunately, because Sharp is an electronics manufacturer, there were many existing featured technologies, along with departments and people with know-how. Many departments got involved. The Electronic Device Development Department supported small-sizing of a high-voltage battery and IC devices. Departments with optical design technology supported small-sizing the fluorescence detecting structure. Products departments supported PC coordination and test evaluations, which all led to cost reduction as well. A new issue arose. In actual use environments, detection by heat induced increase of fluorescence, making large particles such as mite corpses, feces, and pollen glow tens of times brighter than small bacteria and mold spores, thus making their weak glow undetectable. Developers of cyclone vacuum cleaners were called in to solve this issue. Although they may seem unrelated, the principles of cyclone technology were applied to centrifuge air and dust, enabling removal of more than 99% of large particles disrupting microbe detection, despite the sensor's small-sized structure. Such efforts finally led to the development ｏf the Microbe Sensor that can automatically measure the amount of airborne bacteria and mold spores in approximately 10 minutes at minimum. The unit can be connected to a PC and can conduct sequential measurements, so monitoring the change in microbe amounts over time can be done as well. Since the Microbe Sensor is a product totally new to the world, there were no sales routes at the start. While we were introducing the product on our website, product introduction meetings were held in Tokyo, Nagoya, and Osaka, where many food processing and pharmaceutical manufacturing companies are located. Other approaches such as posting advertisements in specialized food processing magazines and sending direct mails to Quality Control members were also tried. Currently we are developing our business with various methods, such as customizing the product for each customer, or proposing a package deal with other companies' products. The challenge for worldwide development is also at hand, as we are currently making such efforts as leasing the product to customers in China and the Middle East, and participating in exhibitions in North America. With such efforts, the Microbe Sensor was awarded the 10 Best New Products Awards "Nippon Brand" Prize*3 in 2013, sponsored by Nikkan Kogyo Shimbun in Japan. Sharp will continue meeting its challenge for safety and security of air. *3 The 10 Best New Products Award is sponsored by Nikkan Kogyo Shimbun. The "Nippon Brand" Prize is presented to products leading the world market with Japan-oriented technology.